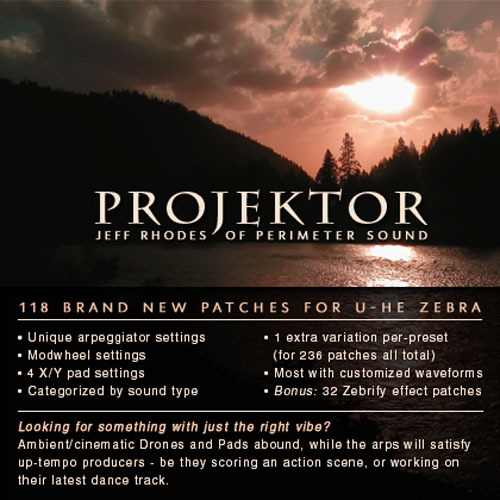 'Projektor: Zebra 2.5' is a preset collection for U-He Zebra 2.5 soft synthesizer created by Jeff Rhodes of Perimeter Sound. This soundset features 118 Brand New Original Patches. Also included is 1 variation of each preset for 236 patches all total. • 32 Zebrify effect patches are included as a bonus. Ambient/cinematic styles are covered, with a heavy dose of Drone and Pad patches. While the arp preset variations aim to satisfy the more uptempo producers - be they scoring an action scene, or working on their latest dance track and looking for something with the right vibe to it. As you would expect, all the patches are tagged with their main category : Bass - Drone - Lead - Pad - Synth. So you can spend your time making music, not looking for the right kind of sound.